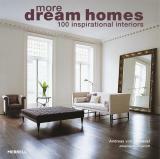 A companion and successor to Merrell’s hugely successful Dream Homes (more than 50,000 copies in print) and now available in paperback for the first time, this book presents 100 exceptional interiors of all styles from around the globe. From sumptuous, state-of-the-art city apartments created by professional designers to quirky holiday retreats transformed by their dedicated owners, More Dream Homes is an exciting kaleidoscope of locations and decoration ideas. Each project is fully illustrated with beautiful photographs by celebrated interiors photographer Andreas von Einsiedel, while Johanna Thornycroft describes concisely the key characteristics of each home and how these have been achieved, providing insights into the work of leading designers. More Dream Homes contains a wealth of inspiration for lovers of interior design or anyone seeking to make their dream home a reality.